The National Park Service describes Yellowstone as a “mountain wildland, home to grizzly bears, wolves, and herds of bison and elk, the park is the core of one of the last, nearly intact, natural ecosystems in the Earth’s temperate zone.” Despite Yellowstone’s gift of refuge to recovering species, two species in particular are facing increasing threats as changes occur in the way they are managed. In the 19th century, an estimated 30–60 million bison roamed the Great Plains, shaping the ecology of the landscape and playing critical roles in Native American and Western culture. By the end of that same century, irresponsible hunting and the carelessness of Americans had whittled the population down to a mere two dozen animals in Yellowstone National Park. Since then, Yellowstone has been a refuge for free-ranging bison to recover from the near extinction they faced in the 1800s, protecting them from interbreeding with cattle. In Yellowstone remain the last truly wild bison. Tourists from all over the world flock to Yellowstone to see the iconic Great Plains species. And in 2016, President Obama declared the bison our National Mammal. Despite these positive steps toward restoring wild bison, they face new threats as they grow in population and migrate outside the National Park boundaries to winter breeding grounds and new habitat. Dictated by an out-of-date 2005 Interagency Bison Management Plan (IBMP), wildlife managers have used aggressive tactics to manage the species inside and outside Yellowstone including hazing bison back into the National Park boundaries and culling the population down to just 3,000 animals yearly through a managed hunt and, often, outright slaughter. In 2016, over 600 bison were removed from the population to meet management goals and to calm fears from the livestock industry over a nonexistent threat of a bison-to-cattle disease, called brucellosis. This year, Yellowstone has proposed to cull 1,300 bison to comply with their out-of-date mandate. Despite the ongoing culling, Montana has made a slight movement to protect Yellowstone’s bison over the last year. Governor Steve Bullock expanded year-round habitat outside of Yellowstone National Park, giving bison more room to roam during winter months. The 255,000 acres of expanded habitat includes critical areas in the Gallatin National Forest and the Gardiner Basin. While this is a big step forward in some ways, it leaves much to be desired for a real long-term solution. This year, we have an important opportunity to influence how bison are managed. This summer, the 2005 Bison Management Plan is up for revision and the five partnering agencies and three tribal entities who craft it will be seeking public input into the management plan. Patagonia strongly believes that wild bison should be allowed to roam as a free wild species beyond the borders of a National Park and be integrated into the Western landscape as they once were—not as livestock for slaughter but as a wild species. We will be weighing in this summer to work toward a better management plan without the need for the current system of slaughter. We urge you to join us and help protect bison this year. Already in 2017, nearly 1,000 Yellowstone bison have been culled from their herds and sent to slaughter houses. Now more than ever, Yellowstone’s bison need our help to fight out of date and ill-conceived management practices. To learn more about how to fight for our bison, visit Buffalo Field Campaign (BFC). BFC’s primary goal is to create permanent year-round protection for bison and the ecosystem they depend on. There are a number of ways to get involved with BFC, including contacting politicians, writing letters to the editor, volunteering and attending events. Grizzlies once roamed over most of the West before being nearly removed from the landscape by commercial trapping, hunting, habitat loss and conflict with humans. In fact, the five remaining grizzly bear populations in all of the lower 48 today add up to perhaps 1,500, compared to the 100,000 grizzly bears that once roamed the contiguous U.S.
For the last 40 years, the Endangered Species Act (ESA) of 1973 has been vital to sustaining grizzly bear populations. The ESA signaled an end to the slaughter of grizzlies across the Western landscape: It stopped sport hunting, reduced availability of human garbage and foods that led to bear-human conflict, cut back grazing of domestic livestock on public lands and closed roads, giving grizzlies a chance to regain their footing and habitat. Since 1975, recovery efforts have occurred in the Greater Yellowstone ecosystem, the Northern Continental Divide Ecosystem, the Bitterroot Ecosystem, the Selkirk/Cabinet Yaak Ecosystem and the North Cascades Ecosystem. Despite best efforts to fully recover bears in each ecosystem, recovery has been slow and often thwarted by federal and state politics. Grizzly recovery in Yellowstone has been no exception. As a result of ESA protections Yellowstone’s grizzly bears have slowly increased in number from 136 in 1975 to a current population of 650–700 bears. But that’s a far cry from the 2,000-plus animals widely considered by experts to be necessary for long-term viability in the ecosystem. 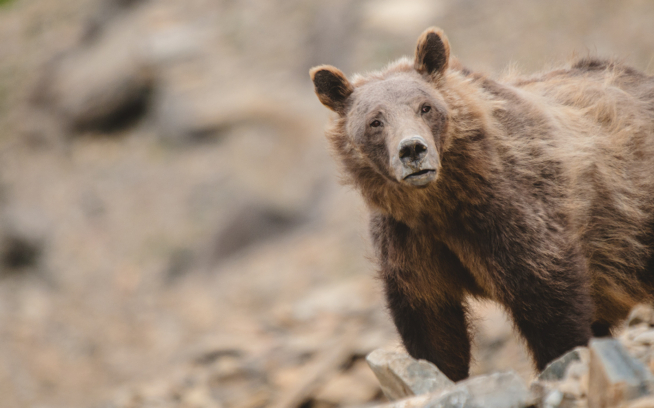 As threats from climate change, industry development and human encroachment increase, now is not the time to gamble with our landscapes and iconic species like the grizzly bear. In 2016, the U.S. Fish and Wildlife Service (USFWS) took steps to delist the Yellowstone grizzly bear from the ESA. 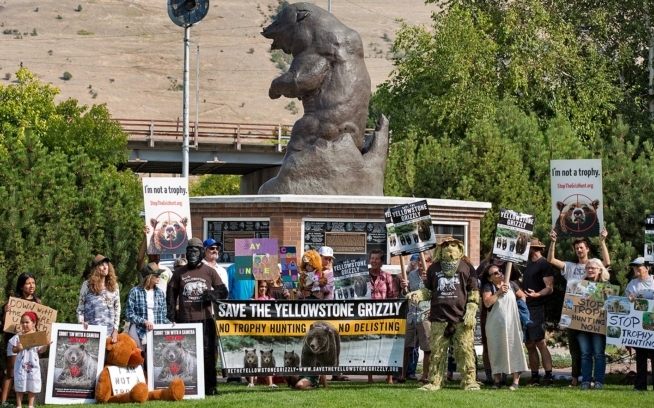 The three states surrounding Yellowstone National Park (Wyoming, Idaho and Montana) have announced intentions to sponsor trophy hunting of the bear when delisting occurs. 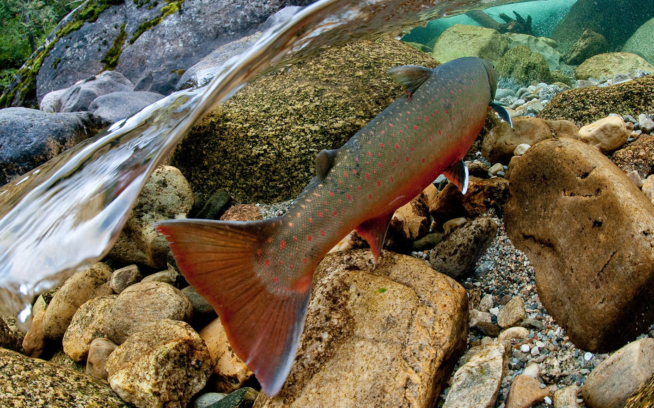 Coupled with the alarming effects of climate change on two of the Yellowstone grizzly’s primary food sources—whitebark pine nuts and cutthroat trout—delisting would likely reverse hard-fought gains and push the bear back to the brink. While all signs were pointing toward a delisting decision to be finalized in 2016, USFWS postponed its final ruling as a result of receiving an overwhelming number of public comments. It may take them until this summer to review and address all 650,000 public comments, buying the conservation community valuable time to prepare its defense. We now anticipate a delisting decision to be finalized early this summer. Now more than ever Yellowstone’s grizzlies need our help. Patagonia strongly opposes delisting the Yellowstone grizzly bear population from the Endangered Species Act. We will be working with partners such as Park County Environmental Council, Sierra Club, Guardians of Our Ancestors Legacy and Save the Yellowstone Grizzlies to find a path forward for continued protection. We invite you to join us in this fight. Stay informed and get involved with these organizations working to protect grizzlies. This story first appeared in the Patagonia Spring 2017 catalog.